He suddenly put down his mic to pose in the middle of his rap, proving everyone that his group performs live. It's the same thing as proving everyone that they eat CDs..
With that one gesture, he clarified all of the controversies that have been around for awhile (ex. 'Are they performing it live?' etc). -Game over.. I hope people would stop doubting their skills anymore..
-My idol is so cool!!! -Min Yoongi is a genius, jjang jjang man, bboong bboong!!! -I'm more surprised at the fact that there were people doubting their skills..
-Yoongi, you're the best.. You looked so cool yesterday!! -What do you mean after 5 years??? -This is Suga's first time performing in Gayo Daejeon in 5 years! He has been sick..ㅠㅠSo it's his first time attending Gayo Daejeon! -People don't call them God-Bangtan for nothing..
-I didn't know there were controversies about their performances before..
-He looked so cool when he stared at the camera as he put down the mic..
-They're really good that's why people often mistook them as lipsyincing ㅠㅠ Anyway, BTS is the best! 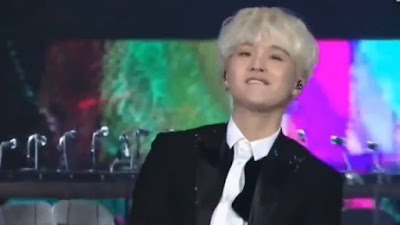 -The award of the coolest man this year goes to Min Yoongi..